One of the latest trends in the world of interior design has a distinctly oriental flavour. Don't worry, we aren't suggesting wind chimes, dragon patterned drapes, or katana swords wired onto your living room walls. This is a mature, sophisticated riff on the patterns and colours of the Orient, based on rich dyes and intricate designs that took talented craftsmen centuries to perfect. Designer Carmen Marc Volvo once explained his love of Pantone's Poppy Red as "a reflection of the Oriental influence on interior design", a love which is currently experiencing a careful resurgence in chic homes across Britain. These Elana Lipstick curtains, in pink and gold, are a bold centrepiece for any room, drawing on the colour pink, a summer favourite. The gold references the costly embroidery typical in many an Oriental home. 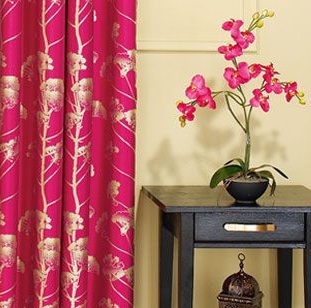 Here the curtains are paired with black, gold, and a beautiful matching plant in the same bright hue. Pink is a beautiful colour, however it may be challenging for some when it's this bright, especially in a main room. You can channel the oriental trend in a more subtle way by upholstering an elegant easy chair with this delicious, kimono silk inspired fabric. It retains the exquisite patterning of the Orient in a less bold but still beautiful colourway. Pair this delightfully subtle chair with genuine – or high quality reproductions – of antiques from Japanese history. You can buy these from Etsy or Ebay, but do check how long they've been trading and their feedback to avoid being ripped off. Or else consider purchasing some vintage oriental fabric and making your own. For a quick, yet no less exciting nod to the Oriental trend, why not try these dining chair covers in Mandalay's red fabric? China has a long association with red dyes, exploiting the properties of the madder root, and safflower, to achieve beautifully rich hues. These loose covers, in a rich red, accented by the golden foliage and swirls so typical of oriental affluence, will give instant life to a neutral and pedestrian living room. Pair with soft golden accessories and a burnished copper lampshade for an exotic yet elegant look. Remember, Plumbs offer free, no obligation advice in your own home, and a chance to browse fabric samples at your leisure. If your furniture needs a new look, and you want a bespoke, high quality solution, contact us today!